Just 1:33 into the game, Nick Bjugstad gave the Penguins the lead off a bad turnover in the Boston end. Patric Hornqvist, in something of a role reversal, throws a shot on goal from the right circe. Nick Bjugstad uglies it in, 1-0. Jaroslav Halak was under siege in the first few moments as the Bruins were incredibly lax in their own zone. The bad start continued as the B’s were called for a too many men on the ice penalty as Pittsburgh looked to double the lead. The Bruins killed off the man advantage as the Penguins failed to get any significant scoring chances. The Bruins continued to struggle in their own zone as the Penguins got chance after chance but Halak kept it a one goal game. Matt Grzelcyk went off for hooking with about 11 minutes to go in the period as the Penguins looked to extend the lead. 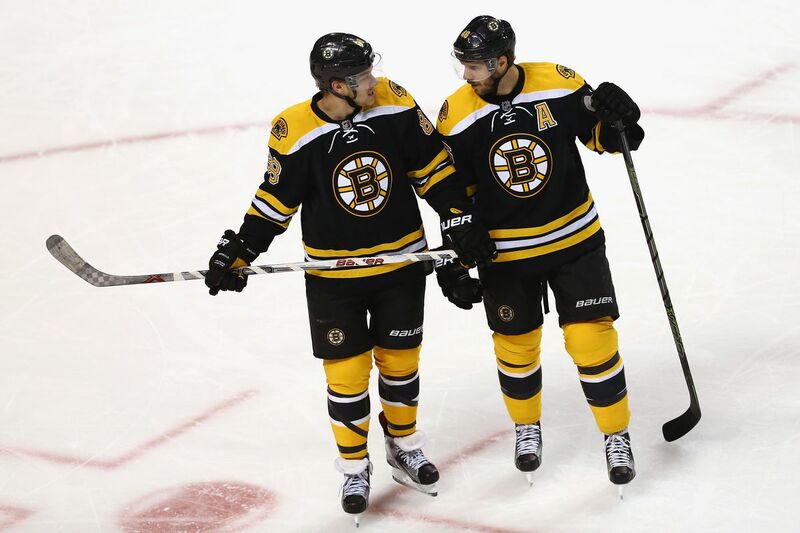 The Bruins killed the man advantage yet again and even got a few shorthanded opportunities. The Bruins finally got their legs moving in the latter half of the period and they even picked up a power play as the Penguins were called for a delay of game penalty. After a turnover in the offensive zone, Jared McCann scored on a shorthanded breakaway to double the Pittsburgh lead. The Penguins killed the Boston power play without giving up any great scoring chances. Almost immediately after the man advantage, Chris Wagner was called for tripping which resulted in the third Pittsburgh power play of the opening period. Evgeni Malkin negated the man advantage as he tripped Charlie McAvoy which resulted in a four on four. The Bruins were unable to score on the abbreviated power play, keeping them down by a pair. With 33 seconds left in the period, McCann went off for interference as the B’s looked to cut into the Pittsburgh lead. The period ended with the Bruins still on the man advantage. The Penguins killed off the early power play as the Bruins continued to struggle to get scoring chances. With 17:41 to go in the period Grzelcyk went down after a shot to the arm from Patric Hornqvist and went down the tunnel. The Bruins would get yet another power play as Zach Trotman went off for slashing. David Krejci cut the lead in half after a scramble in front as the Bruins found the back of the net on the man advantage. Patrice Bergeron was called for a delay of game penalty which resulted in another Pittsburgh power play with over 13 minutes left in the period. The B’s killed the penalty as the Penguins failed to generate any chances. The Bruins started the move the puck quicker towards the end of the period as they looked better than they had at any point in the game. Brandon Carlo was called for tripping with under four minutes to go in the period as the Penguins looked to regain their two goal lead. Jake Guentzel finished off a two on one after a great feed from Sidney Crosby to double the Pittsburgh lead on the man advantage. Halak made a couple of important saves in the opening moments of the period to keep the Bruins in the game. Wagner drew a penalty in the attacking zone as Trotman took him down, resulting in another Boston power play. The Penguins killed off the penalty as Matt Murray made a couple great stops to keep it a two goal game. The Bruins started to get their skating game going as the period went on but continued to have trouble getting chances. Another huge stop by Halak on Guentzel kept it a 3-1 game as the Bruins tried desperately to look for some kind of positives as the period drew to a close. The Bruins got some chances towards the end of the period as they looked to get back into it and extend their point streak. The B’s pulled the goalie with over three minutes to go trying to get a pair. John Moore cut the lead in half with a shot from the point that beat Murray with 1:01 to go as the Bruins tried to pull off another last minute comeback. John Moore scores to cut the lead to 1! McCann iced it for Pittsburgh with an empty net goal with about 20 seconds to go as the Penguins put an end to the Bruins streak. Jared McCann hits an empty net, and the Penguins are gonna win this one and end the Bruins’ 19-game point streak. First Star: Murray. The Pittsburgh goalie was at his best in this one, stopping 39 shots in all. Second Star: Halak. The Bruins were kept in the game especially in the third period by Number 41 who had another strong night despite the three goals against. Third Star: McCann. Two goals including the empty net goal from McCann was the difference in the game for the Penguins. One point separated the Canadiens and Bruins heading into this one while they sat in third and fourth place respectively. Important divisional points were on the line. Montreal came in winners of their last two, while the Bruins came in losers of their last two looking to right the ship. The game didn’t stay scoreless for long as Joakim Nordstrom scored 2:21 into the game. Some great forechecking and passing from his linemates helped make it happen. The goal marked Nordstrom’s fifth of the year, assisted by David Backes (5), and Colby Cave (3). Brad Marchand went to the box shortly after for high-sticking. Montreal came into the game without a single goal on their last 22 power play opportunities. Two shots on goal and two minutes later, Montreal failed to convert on the man advantage. Halfway through the period, Montreal had 11 giveaways to Boston’s one giveaway. The energy was there, just not a lot of cohesiveness. Noel Acciari went to the box delay of game at the 6:28 mark – round two on the power play for Montreal. John Moore and Charlie McAvoy were integral to eventually kill the penalty and keep the lead intact while they were down a man. 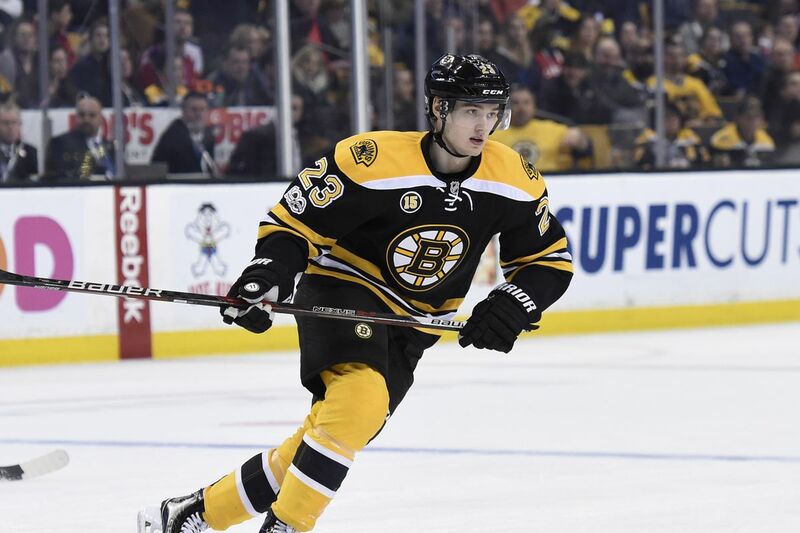 After making a series of moves in the offensive zone, David Pastrnak drew a tripping penalty with 3:04 remaining – the Bruins were scoreless on their last seven power plays in their last three games. 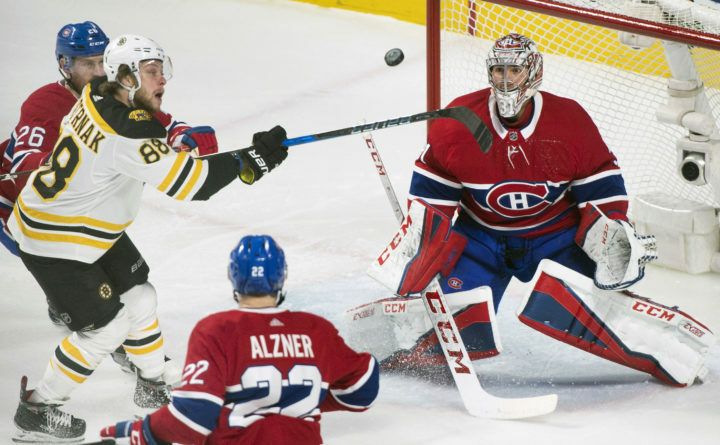 It was a sloppy first power play for the Bruins as they had trouble connecting passes at times and struggled to get much of anything going in Carey Price’s office. The best chance came after the conclusion of the man advantage when Noel Acciari nearly stuffed a wraparound past Price. Giveaways were ever so present from Montreal and the Bruins surely would have liked to convert more than once. The shots were 12 to 5 in favor of the Bruins, Montreal ended up with 14 giveaways to Boston’s one. The energy was there for the Bruins, but the execution could have been better. The momentum was in their hands heading into the intermission and beyond. The scoring chances continued to come from the Bruins early, specifically from Pastrnak and Acciari. The occasional too many men on the ice penalty struck against Montreal just 2:29 into the period. No dice on the power play, zero shots on goal. A flurry of chances came for the Canadiens about halfway through the period in just under a minute of consecutive zone time. Shortly after, former Bruin Kenny Agostino was robbed by once former Canadiens goaltender Jaroslav Halak. It’s not too often you see two delay of game penalties in one game, but David Pastrnak unintentionally made that happen. Some power plays came and went on both sides, both teams found no luck with the man advantage. Price robbed Pastrnak in space on the backhand. Neither goalie was budging after Nordstrom’s early first-period goal. He then managed to rob Torey Krug with his glove as he flew down the left wing. A four-on-four came late as Sean Kuraly went to the box for holding, as did Jesperi Kotkaniemi for interference – lots of open ice for someone to break through and get on the score sheet. Colby Cave picked up his second point of the night and first goal of his NHL career off of a beautiful passing play involving Pastrnak up high and McAvoy down low. McAvoy picked up his seventh assist, Pastrnak his 19th. The assist marked McAvoy’s second point since returning from injury on Dec. 6 against the Tampa Bay Lightning. There wasn’t much of the usual Bruins-Habs nastiness as we have seen in the past until the last three minutes of the frame. This time we saw a goaltending battle and a cut-and-dry game through two periods for the most part. The Bruins dominated the shot category with a 13 to 7 advantage in the second period, 26 to 12 overall. Things got going real early thanks to an iffy Montreal line change. David Krejci buried his sixth goal of the year on the back door to extend his point streak to seven games. Charlie McAvoy’s eighth assist of the season and second of the game helped make it all happen. The Bruins extend their lead to three. David Krejci extends his point streak to 7 games. Mike Reilly’s roughing penalty set up a power play that led to the fourth Bruins goal of the game, this time from Brad Marchand. Marchand’s 11th goal was assisted by Pastrnak (20) and Krug (16). It was 4-0 Bruins with 14:54 to go. Fantastic feed from Torey Krug leads to a power-play goal for Brad Marchand. This game turned on its head really quickly. The Bruins took advantage of what was a sloppy game on Montreal’s end for much of the time. Outside of their extended zone stint midway through the second period, it was almost all Bruins. Halak capped it off on a great chance in transition late. The 22-save effort marked his third shutout of the season. The energy they got thanks to a good deal of puck possession, scoring chances and Nordstrom’s goal in the first period propelled them forward throughout the game. Things progressively got better as the game went on. In one of their better 60-minute efforts this season, the Bruins outshot the Canadiens 9 to 8 in the third and 35 to 22 overall. Next up are the Anaheim Ducks at 7:00 PM ET on Thursday at TD Garden.